Chicago Shakespeare Theater serves as a home for audiences to explore and enjoy Shakespeare—and combining our creative capital with the spirited innovation of artists like The Q Brothers yields work that transcends age and culture. Following an acclaimed world premiere in London at Shakespeare’s Globe and wildly successful tours to Germany and Edinburgh, Othello: The Remix finally made its American premiere earlier this month in the theater Upstairs at Chicago Shakespeare, where it is currently playing through April 28. Othello: The Remix is part of CST’s ongoing collaboration with renowned Chicago hip-hop artists, The Q Brothers. Created in collaboration with CST Creative Producer Rick Boynton, it exemplifies our steadfast commitment to explore how Shakespeare speaks directly to modern audiences. 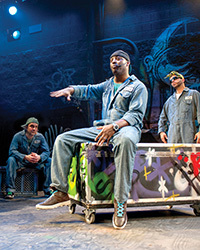 This high-octane, urban interpretation imagines the Bard’s tragedy in the fierce, frenzied world of the rap music industry—the infamous Moor now “MC Othello” and jealous Iago, a disgruntled member of his crew. Audience members might be surprised to see how fluidly Shakespearean comedy and tragedy translate into the modern-day vernacular of hip-hop. Check out the action yourself with this video preview.